I feel confident that the only way I can now catch up on my 12 pairs of socks in a year is to knit a pair of shorty socks. This is ok with me, because I have been seeing the Rose City Rollers pattern all over the place and really wanted to knit it. I also had a ball of mystery sock yarn hanging out in my stash for practically ever. I think it was given to me for free and it never did have a ball band or anything. So, since I didn’t know how much of it I had, this seemed the yarn to use for shorty socks. Which I started on Friday night at Bug’s girl scouts gathering. As you can see, I knit the ankle, the heel flap, the heel, and stitches are picked up for the gusset. 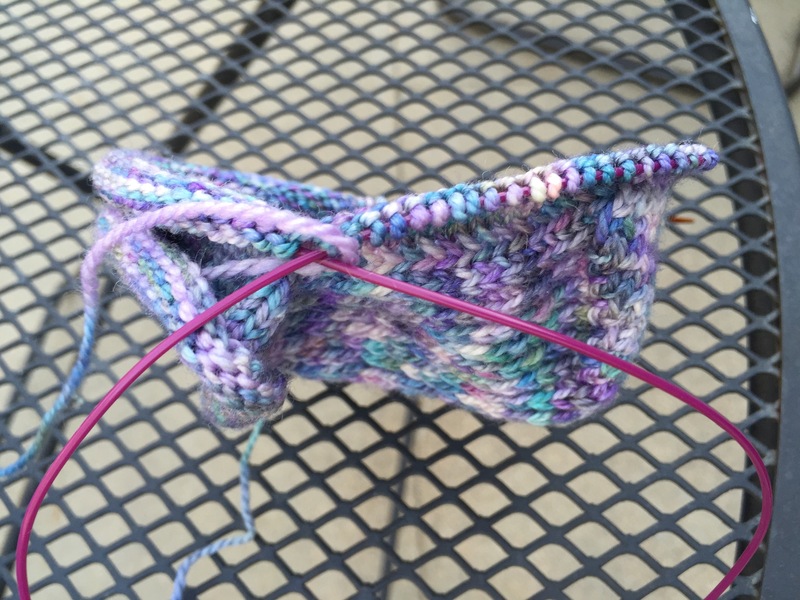 Just the gusset decreases, foot, and toe now. This will be my work sock, as my lunchtime knitting seems the best time to work on those 12 pairs in a year socks.